Hi Neighbors! 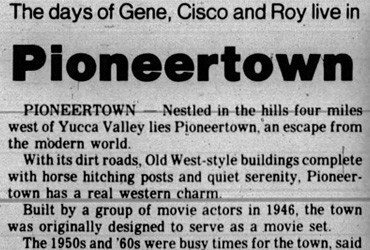 By the time you read this we will be up in the far reaches of the Joshua Desert around Pioneertown, the movie-set where people live. 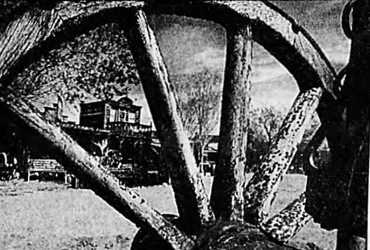 we ride that-away with GENE AUTRY to make two of his television westerns and as usual we’ll be doing a bad old meanie. So next week we’ll give you a report on what really happens when a picture company goes on location. If we can get some of the beauty of the desert and the action of the picture down on paper, it should be fairly interesting reading… so plan on dropping around then will you? 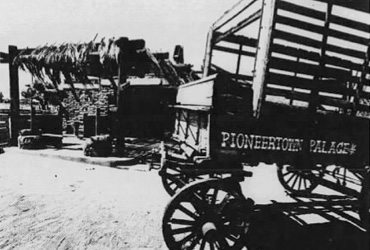 A new trend or cycle has set in here in Hollywood, and you can look for a wave of comedy westerns. Paramount started this round with their BIG CROSBY-HOPALONG CASSIDY pic, and while we’re on that… Bing has brushed aside plans to make another one with BILL BOYD. Maybe Bing didn’t like the idea of playing second fiddle to a cowboy and a horse. But the one that should put a stop to the whole thing is the announced production that will star our punch friend… SLAPSY MAXIE ROSENBLOOM in a western (?) now called “The Adventures of Skip-Along Rosenbloom.” This we gotta see! SPADE COOLEY starts a new series of hoss-oprys for Eagle-Lion this week. His first on is called “Border Raiders” and you know there will be music in it… all the way.